Last week, son-in-law Chris asked for calzone for his birthday meal, but he waited too long—the pizza dough takes at least 3 day to be properly cold-risen. 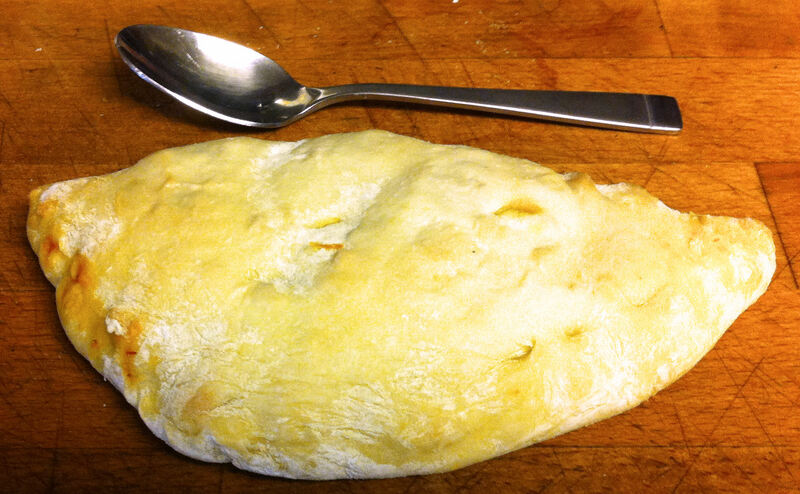 When I make pizza dough it produces enough to make 3 pizzas—a calzone is really just a folded over pizza. I had planned to use only two thirds of this dough for this meal, but the fillings I made required me to use all of the dough—dinner for tomorrow. A Caesar salad completes the meal. I found out that the French girl really liked calzone so I decided to whip some up. I had left over pizza dough when I made the savory beef muffins. I froze it for later use. It is later.